In New England, located in the western mountains of Maine lies an area known as the Rangeley Lakes. 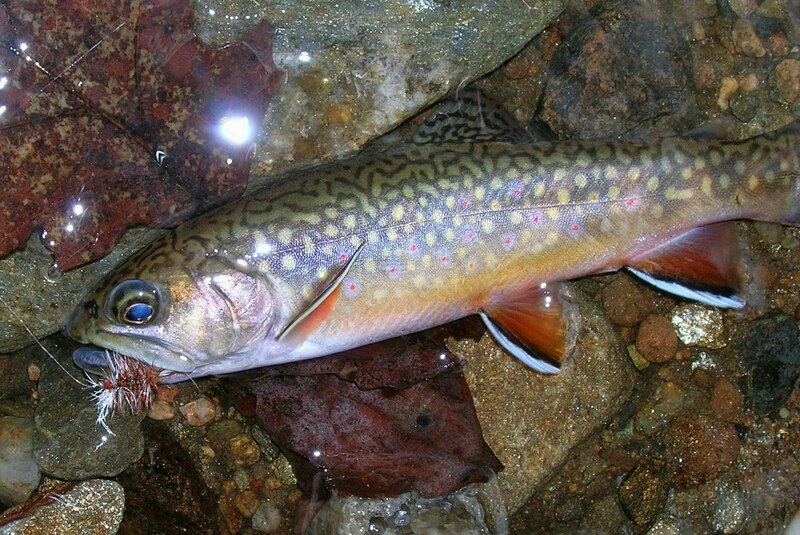 This area is know for its pristine waters and wilderness, brook trout and salmon and fly fishing. 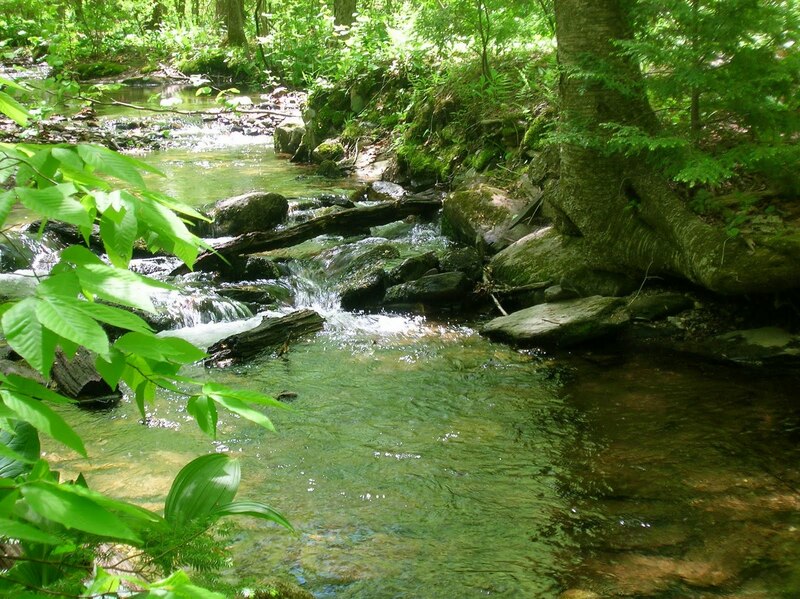 It's also the birthplace of some of the finest streamer flies to ever catch a fish. 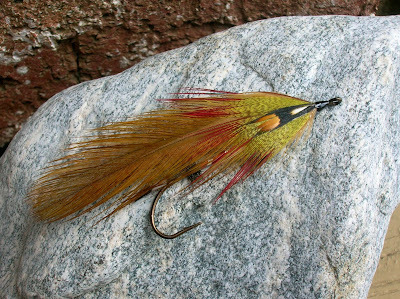 Many of the classic streamers were first tied and fished in these waters, and many of these patterns are still doing their magic today. One particular lady named Carrie Stevens, a fly tyer who created many streamers, including the Gray Ghost applied her talents here. 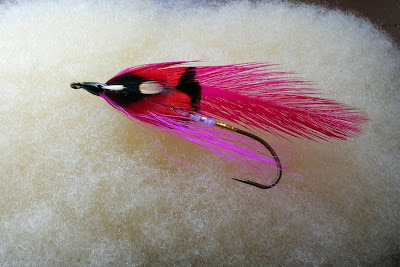 Her flies were said to be tied without the use of a vise, it's a tough task, believe me. 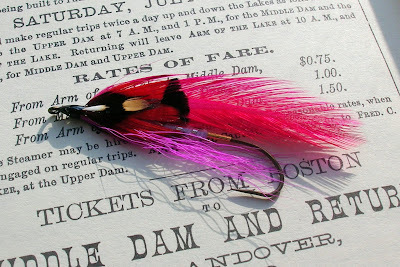 Another fly tyer from Maine, who is doing her part to keep these beautiful flies in the view of many new fly tyers, who find their beauty, and fish taking abilities the need to tie them. This fly tyer is Selene Dumaine. 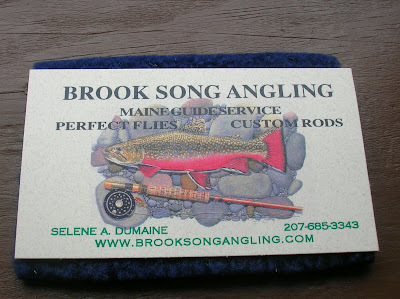 This women has created many of her own patterns, as well as tying the classic Rangeley Streamers, especially Carrie Stevens patterns. Selene can also tie without the aid of a vise. I have the pleasure of possessing two of her patterns, and they are beautiful. Constructed in the Rangeley style, with fine workmanship. So to show my appreciation for what Selene has done to keep this beautiful style of streamer fly, as well as the history of their origins in the forefront of fly tying. I have designed and dressed this streamer in her name. "Selene"
Earth Day 2011 found me at the breakfast table enjoying some favorite fuel, and trying to decide what stream I was going to fish. Tossing a few back and forth I selected a small stream in southeast CT. 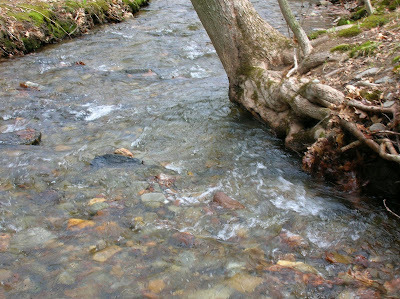 I arrived at the stream to find it almost in perfect condition. 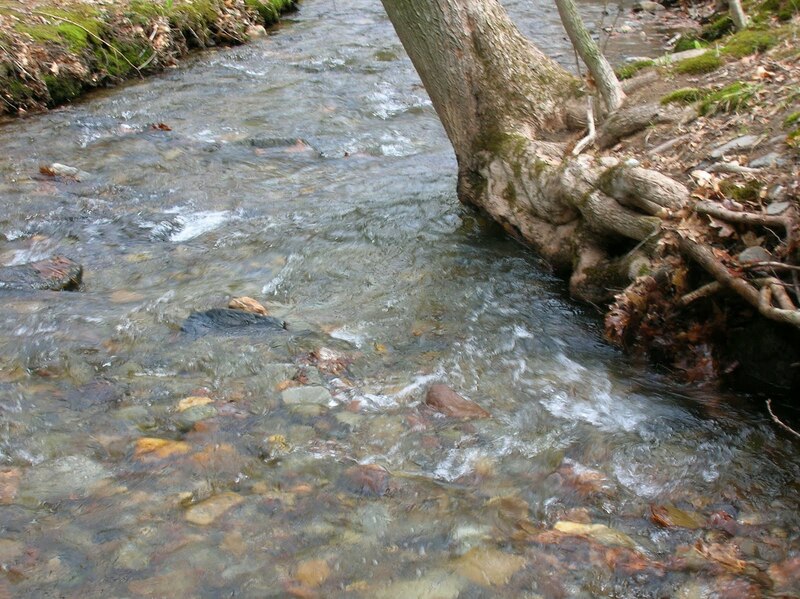 Its flows were good and the water clarity was crystal. The water temps were a bit cool though, registering 52 on my thermometer. The sky was in between cloudy and sunny. 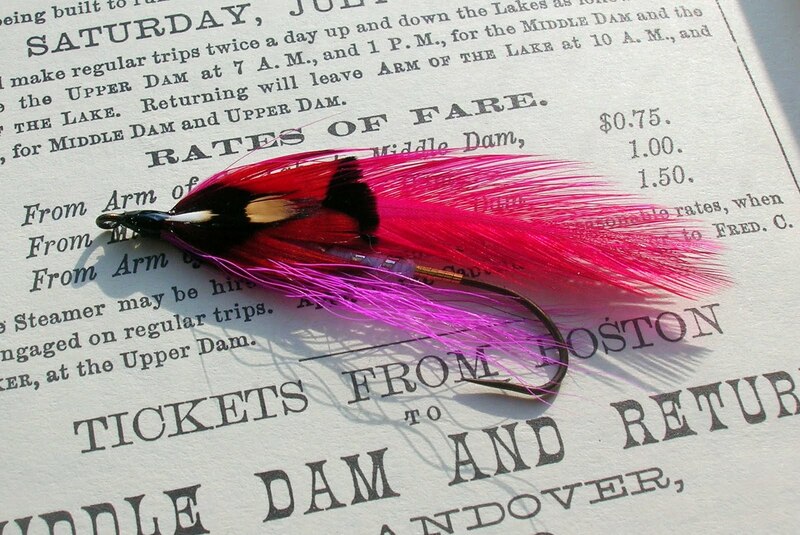 I was going to fish a dry fly today, and tied on a Bomber and sent it on its way. After a few drifts a fish rose to the fly and missed. This was to happen many, many times today, rise and miss. It was almost as if they wanted to kill the bug, but not eat it. I did finally manage to get a hookup and my first fish came to hand. A wild brookie. A tree that grew in the earth, and succumbed perhaps to natures wrath. Now fallen across a natural free flowing stream, creating a bridge for chipmunks,and insects, while and ever so narrow strip of shade to provide sanctuary for trout fry. A fine wild brook trout. 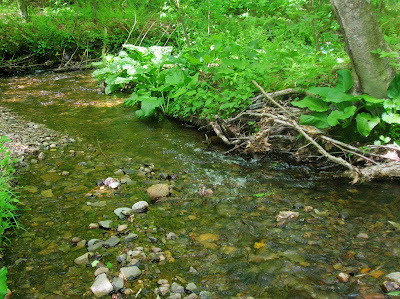 When I came close to this section of stream I knew that was a place for a trout to wait in ambush. Looking at it I also knew one could loose a few flies in there. I let the fly go and as it was swept into the dark undercut bank I pulled on the line to work the fly away from impending loos. 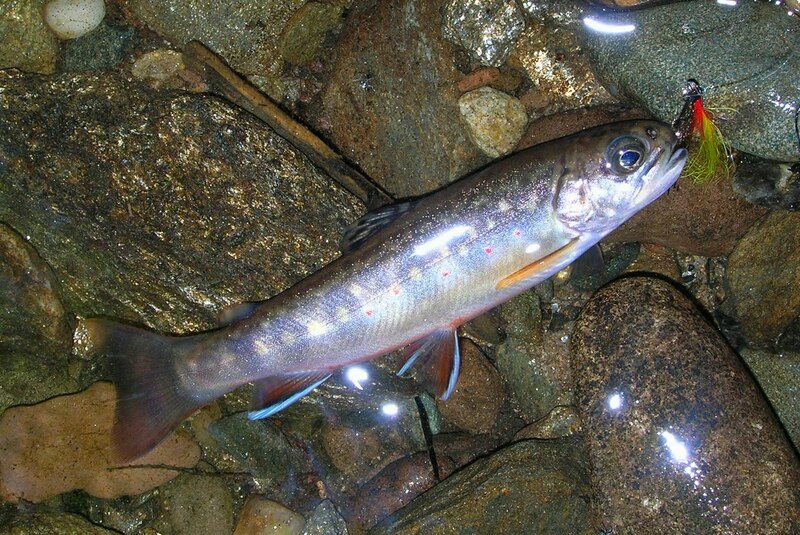 As the fly moved to the surface a flash appeared from the dark bank and I was into a nice fish. 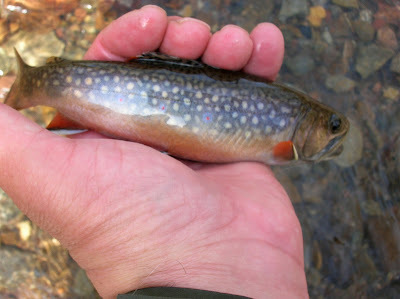 A few moments later a beautiful marked wild brown came to hand. 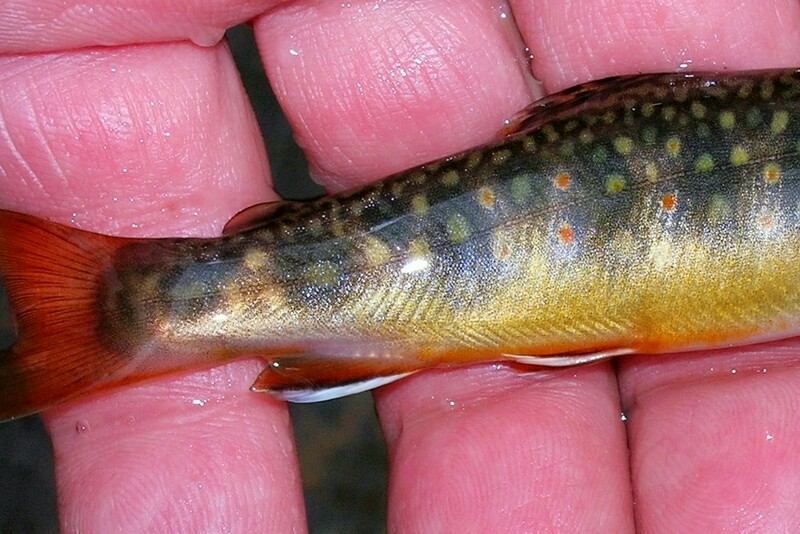 As I placed my wet hand under his body I could not believe this fish came from such small water. I quick photo and off he went. 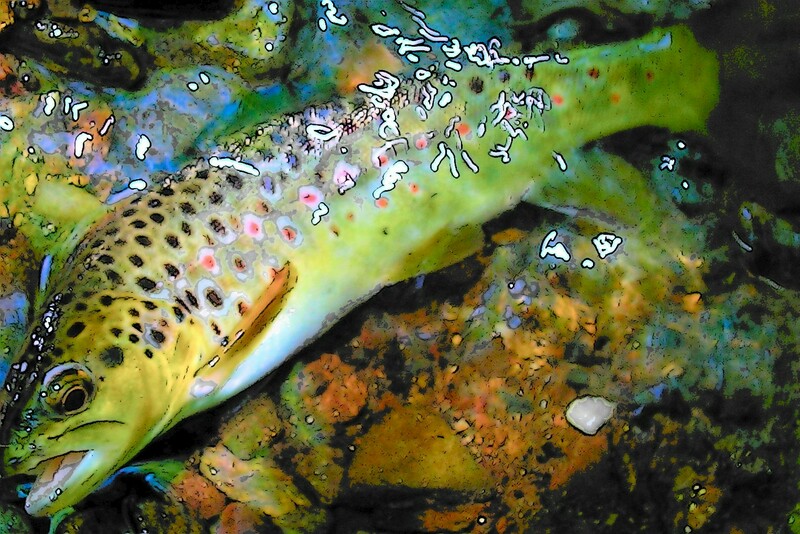 The handsome wild beauty of this brown trout, dark spots, red spots, broad and healthy. This Earth Day was very good to me. And I say thanks. This guy was taken the other day. 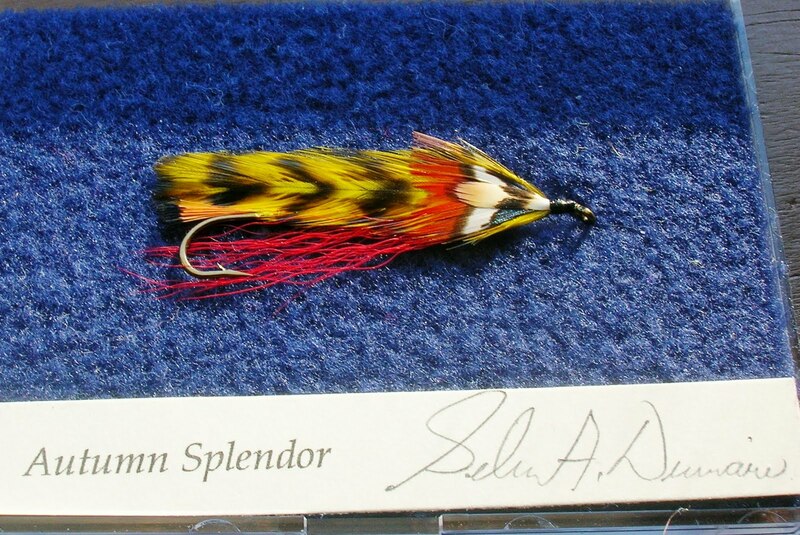 He slammed a Edson Tiger streamer. 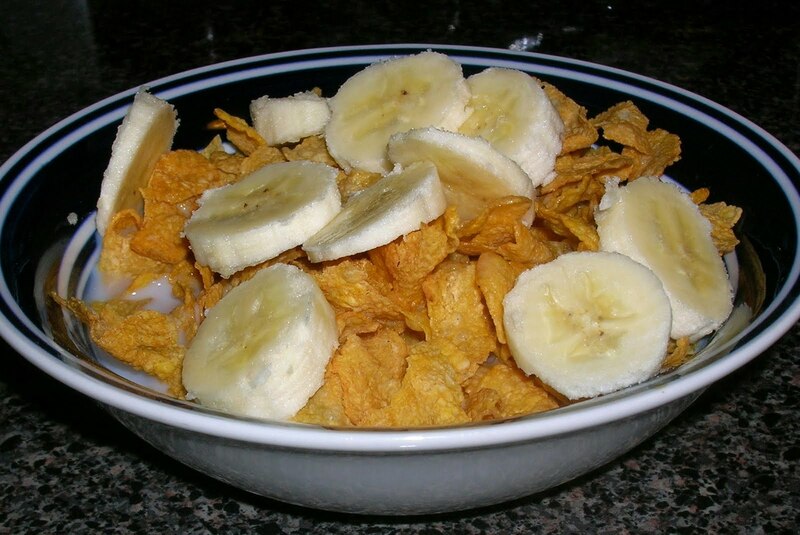 His stomach was full to the top with something. That's the name of this streamer. 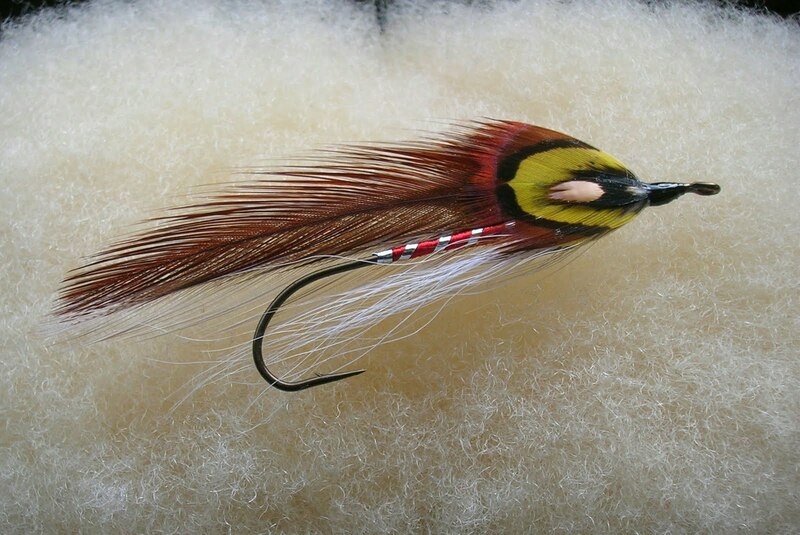 Designed and tied to represent a juvenile brown trout. 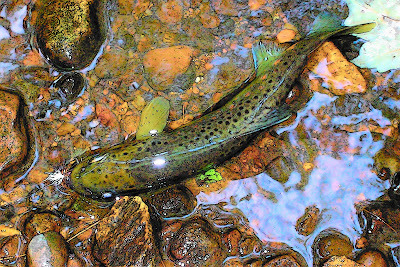 Brown trout are notorious meat eaters, and not at all ashamed to dine on their own, this is why a streamer can be so effective on them under certain instances. 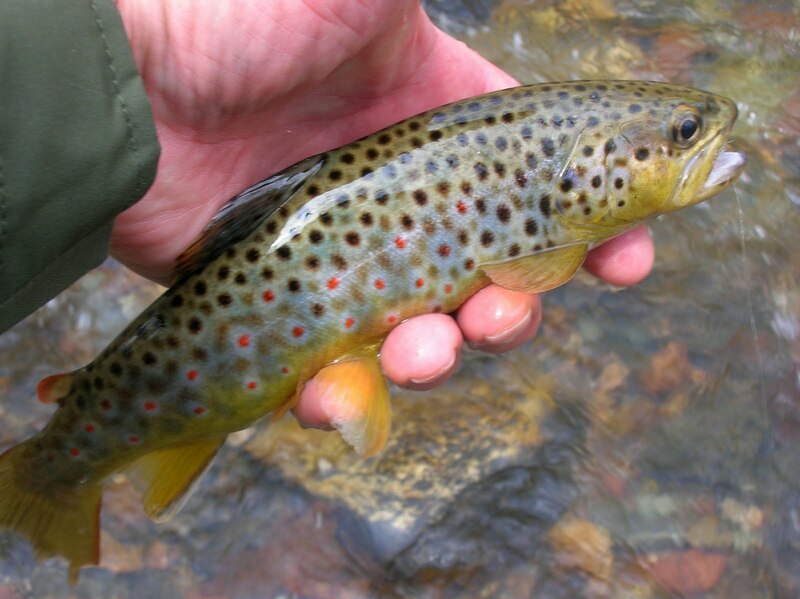 Wild browns can be taken in small streams on dry flies, and they will take them quite readily when the fly is presented well. They like the comfort of a position in the stream where ambush is at their means. 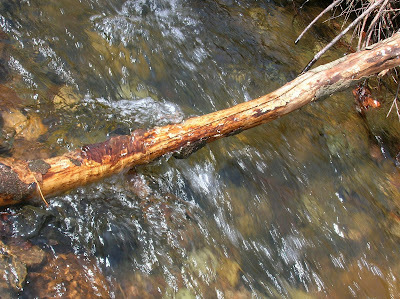 Fish the shadows, along a fallen log, root jams, near undercut banks. Fishing low light times are also a plus. While the beauty of a brook trout in my opinion is tops, the brown is a close second. Their spotted bodies are very handsome. They are strong in their abilities to shake a fly or take you into a root tangle and say goodbye. 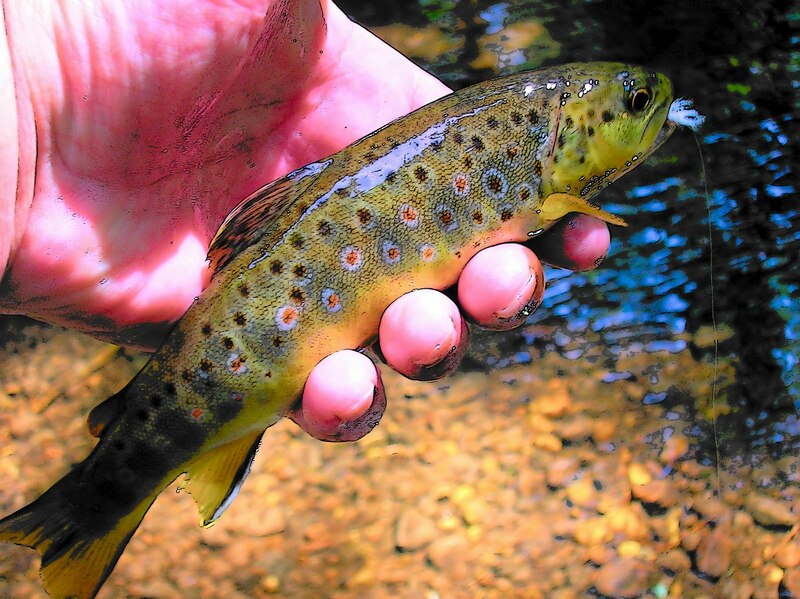 The wild brown taken in a small stream, with a 3wt is a tussle that's hard to beat. 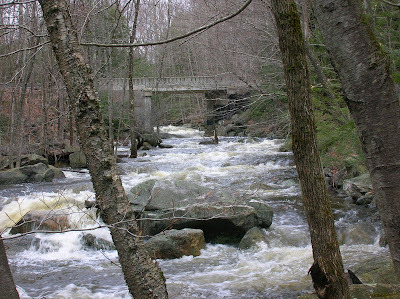 This is a small stream I fish in western Massachusetts, the morning after the rains came. 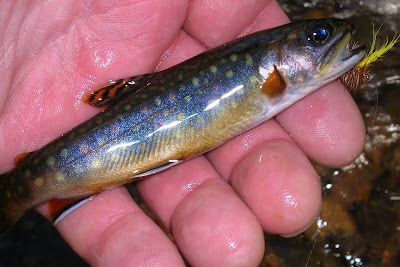 Hang on brookies. 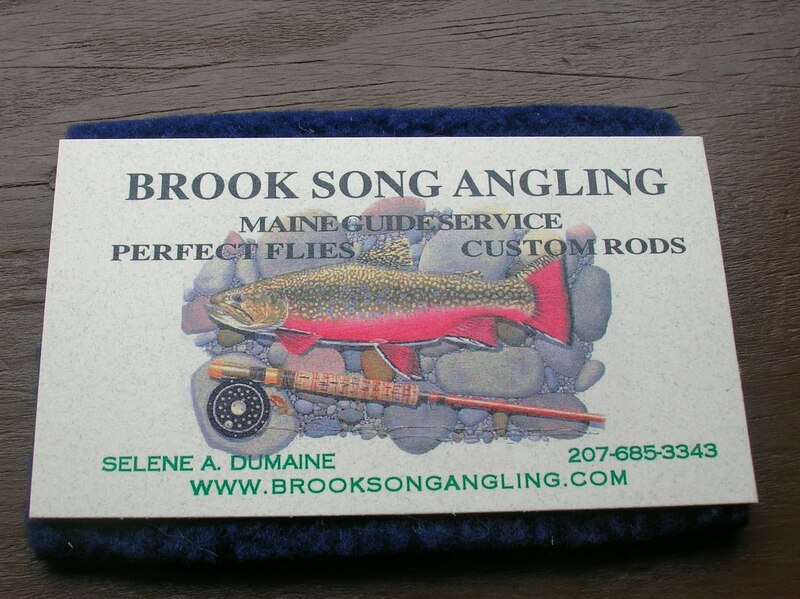 This is a book reccomended by "Millers River Fly Fisher". It's a very good read. If your ever in Granville, MA. You must stop here. The Granville Country Store, and buy some of their cheddar cheese. The finest cheddar you'll ever eat. This is how I rig my fly line,leader, and tippet. I have been using this set up ever since I discovered braided leaders,many years ago. This makes it easy to change tippets. 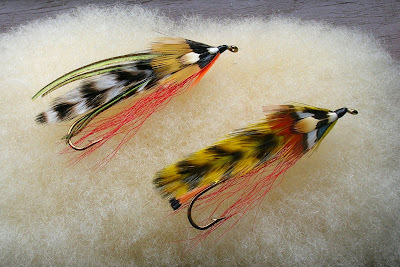 These braided leaders will last a long time, I only replace them when they have wind knots, or become frayed from the thorns along some of the small streams I fish. 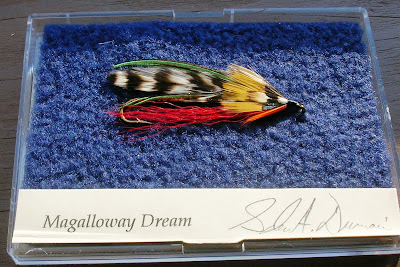 This is a rainbow from a small stream that fell to an Edson Tiger streamer. 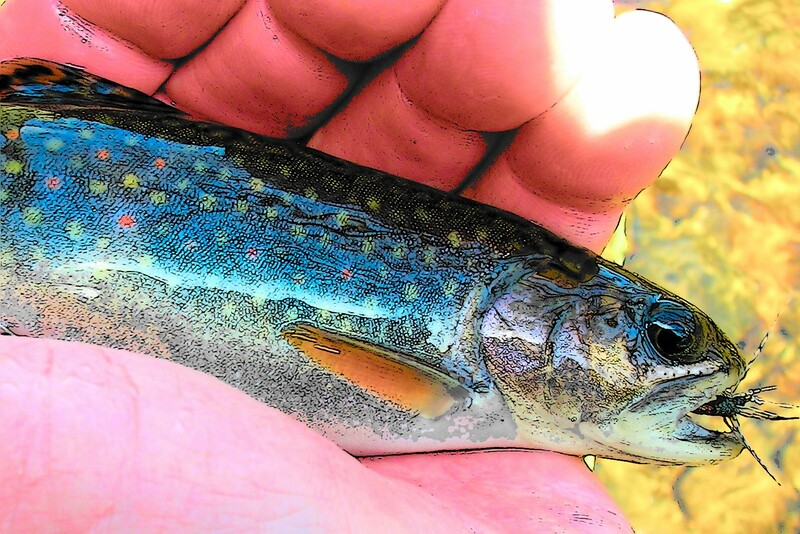 Saturday was opening day of inland fishing, and the traditional heavy turnout of anglers took place at all of the major areas where the state stocks trout. That's not for me, I chose a small freestone stream where I am able to fish with only a wild heron as the second angler. Saturdays weather was windy and chilly, with a dark steely gray sky, more reminiscent with the opening of deer season than fishing season. The wind gusts managed to blow the dry leaves into the stream creating a tough go for a dry fly. 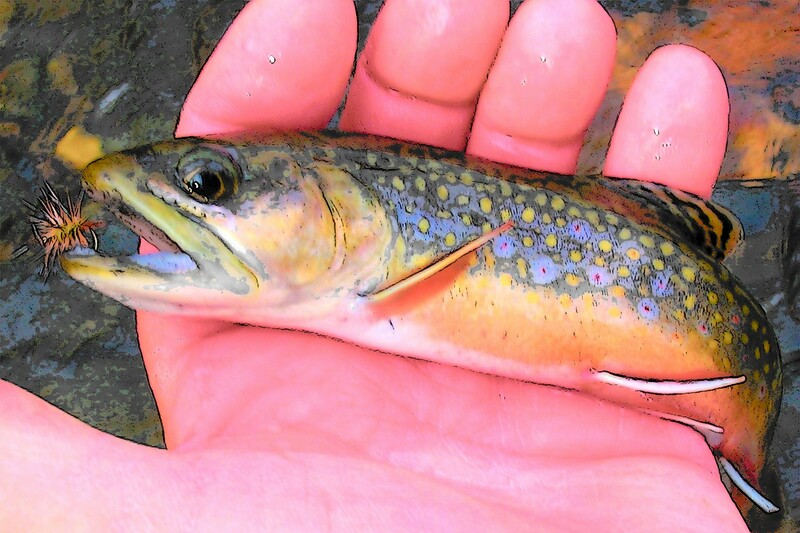 I chose to go with a wet fly, a Pickett Pin, and the little fly worked well, not only in fish attraction but its ability to not bring to many leaves to hand. 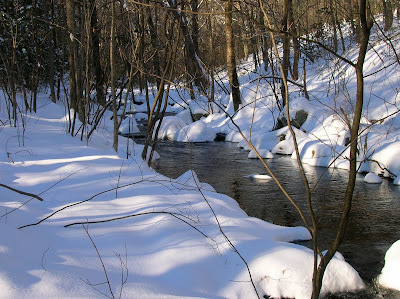 The winters storms and heavy ice managed to reroute the stream from last fall, and it had to be explored as if it were a new stream. The few hours I spent on this stream brought several wonderful wild brook trout to hand, this was a plus to the quiet solitude I enjoyed. 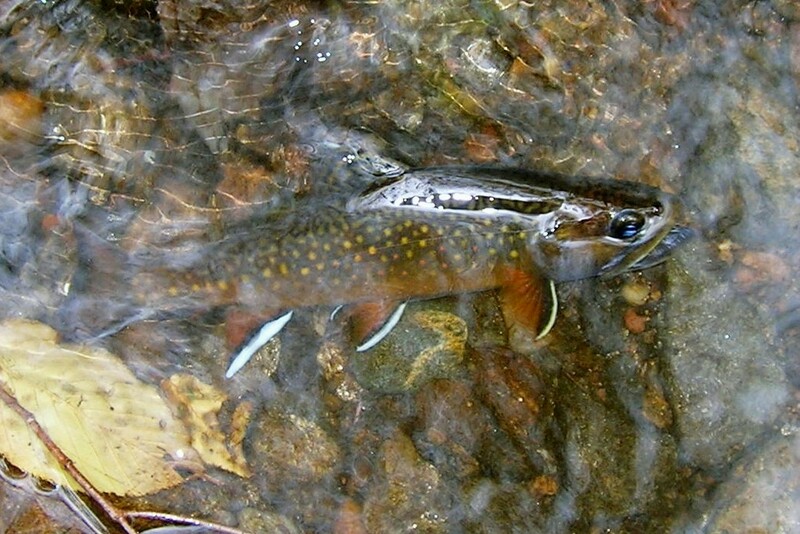 A wild brook trout that managed to survive the harsh winter in good shape. Not an easy place to work a fly, but it's all part of the small stream experience. 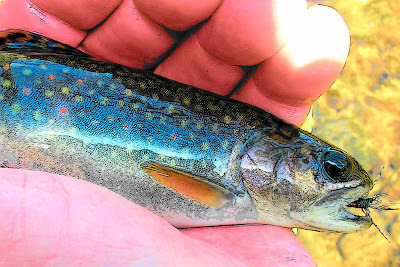 The colors on this little brookie, especially the red tail, can only come from nature. 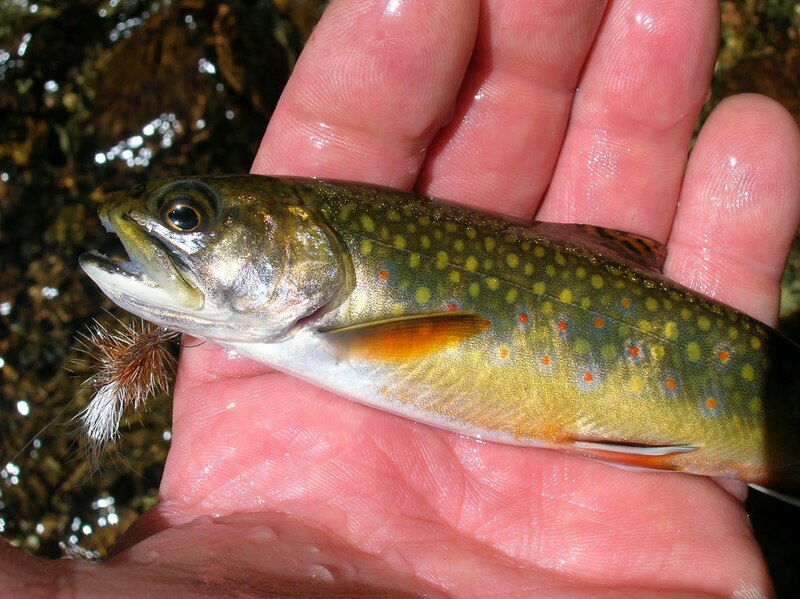 This guy should be awesome come spawning time. There were many good names put forth for this streamer, making a choice difficult. 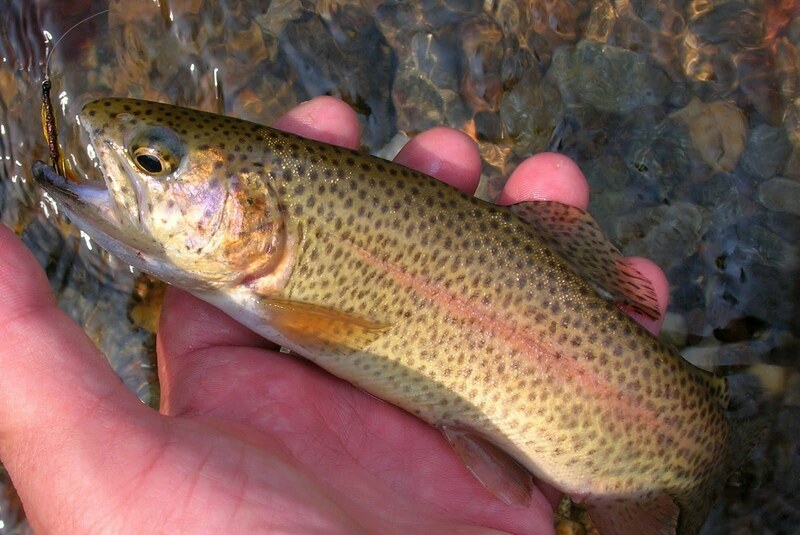 The name selected, "Dream Catcher" submitted by Passinthru Outdoors. Passinthru, email me at uppahdam@aol.com with your address. 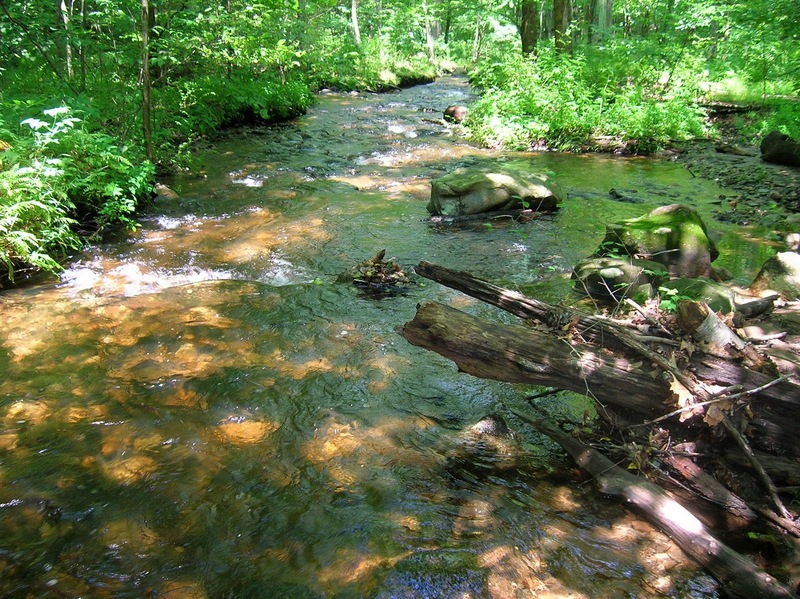 Several years ago while helping to stock Atlantic Salmon fry with the CT DEP, I noticed how very light colored the salmon looked. I asked the biologist why they looked so pale, and would this light color be a negative factor in their ability to survive, being they stuck out like a sore thumb. He told me they were just lifted out of the tank on the truck and they took on the shade of the tank which was an off white color. When they were released into the stream they would head for the bottom and seek out cover in the gravel and within minutes change color and blend into there surroundings. 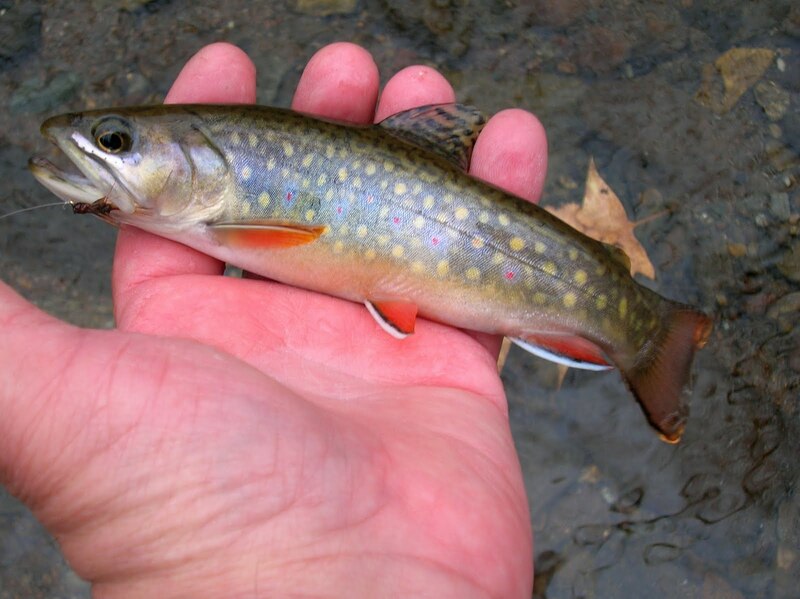 Over the years I've noticed the different colors that brook trout take on, while in the fall they are at their most brilliant colors, they also have various colors depending on the water they are caught in. 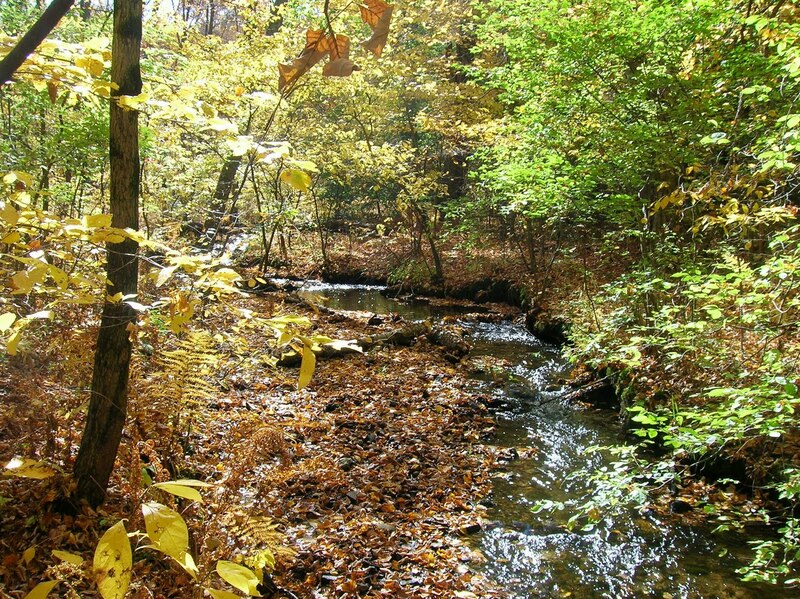 It seems that in light sandy bottom streams they tend to be light in color, in clear gravel bottoms they tend to be somewhat darker in color, and in dark tannic stained water they can be almost black. And in only two instances in the many years of brook trout fishing I have done, I have taken a very bright and bluish colored brook trout, one in CT and the other in brackish water on Cape Cod, MA. A light colored brook trout from a light gravel bottom stream. A brook trout from a darker bottomed stream. A brook trout taken in a dark tannic stained stream. 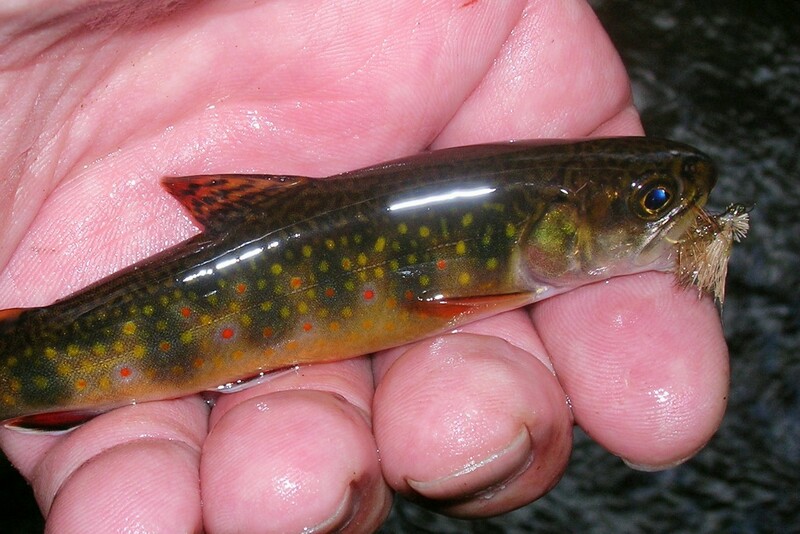 A bluish colored brook trout,taken in a CT stream in early Dec. One of only two I have ever taken that were colored as such. Click on the image twice, and you can see the various colors of these beautiful fish. This diverse color variation may be another way this wild jewel has been able to survive in meager habitats since the ice age. A year ago I started something I had contemplated doing for some time. 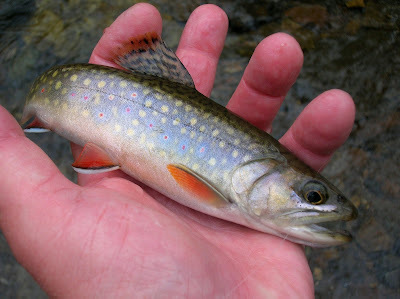 I decided to create a journal of my thoughts and experiences fly fishing small streams. My first post was "Thoughts", and 150 posts later I have barely scratched the surface. I have been able to write about small streams, streamer flies, wonderful locations I have been able to walk, and fish, dry flies that would be able to draw a strike, sometimes food, family, and wild trout. Over the course of this past year I've had the great pleasure of so many wonderful people who have visited my blog and have commented. 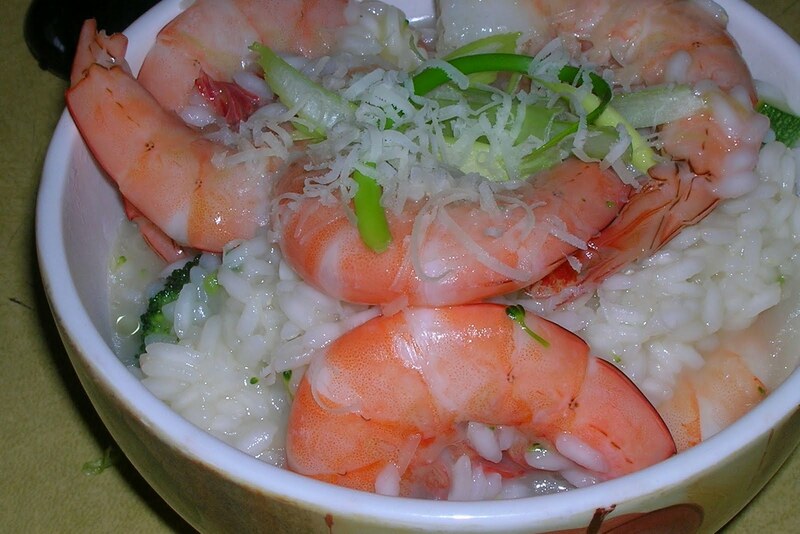 I want to thank everyone for their input, your comments are valued and I enjoy reading and answering them. As I enter my second year I hope I can continue to provide some more of "My Thoughts" in a way you'll enjoy. As a small token of my appreciation to you I would like to offer a streamer fly I designed to the person who can give it a good name. Just Name It. 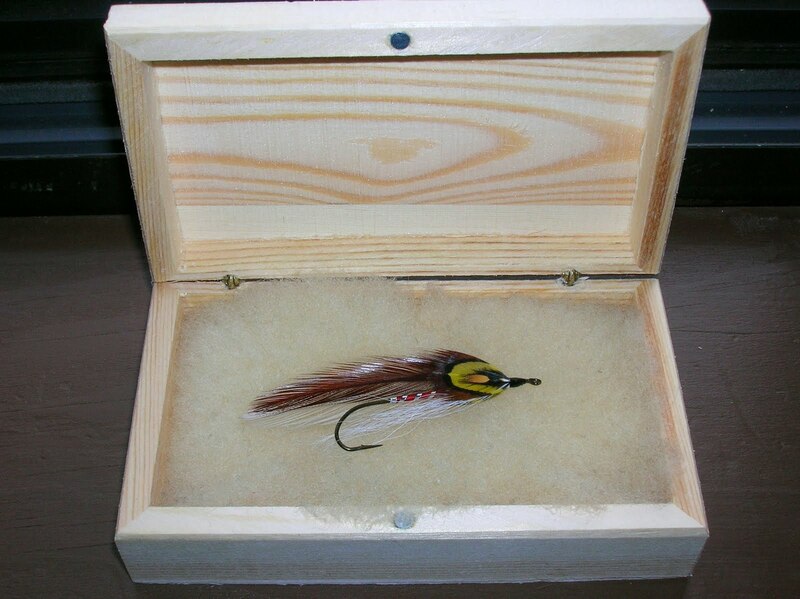 I'll decide the name from the entries, and the person with the best name will win the streamer, along with the wood fly box in the photo. The contest will end Thursday, April 14th at midnight. I'll post the winner on Friday April 15th. A few beautiful wild trout streams I've had the pleasure of fishing. As the seasons change. 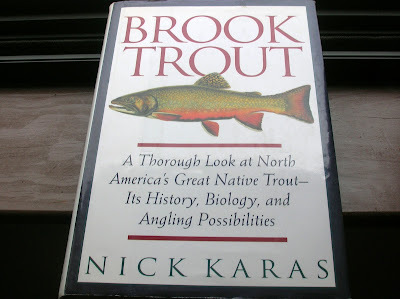 I don't have a large library of fly fishing titles, but I believe I have some of the best books on the subject. 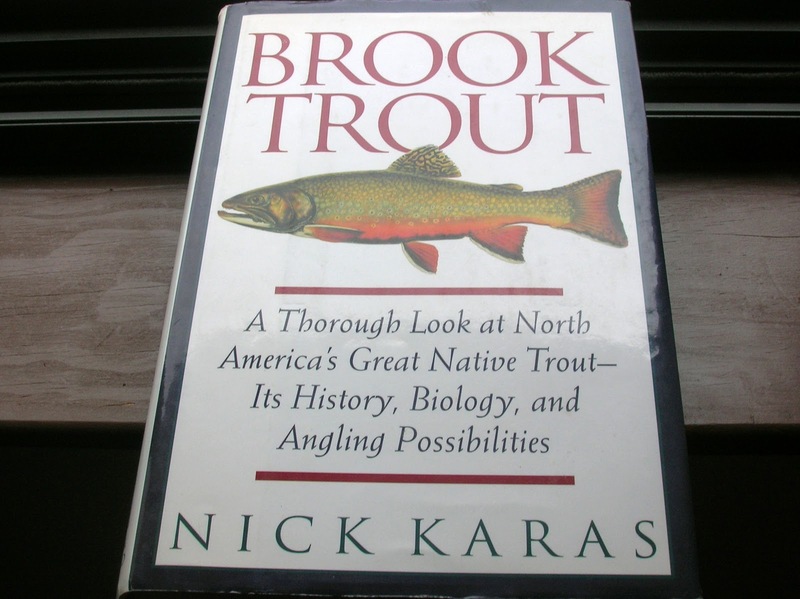 "Brook Trout" by Nick Karas is one of the finest books on the subject of only brook trout. He details everything you may want to know about this wonderful trout. It's an easy read, with some beautiful photos, as well as drawings. After reading this book back in the late 90's, one of the things I said to myself was, how wonderful would it be to catch a brook trout in every state that has these fish native to them. 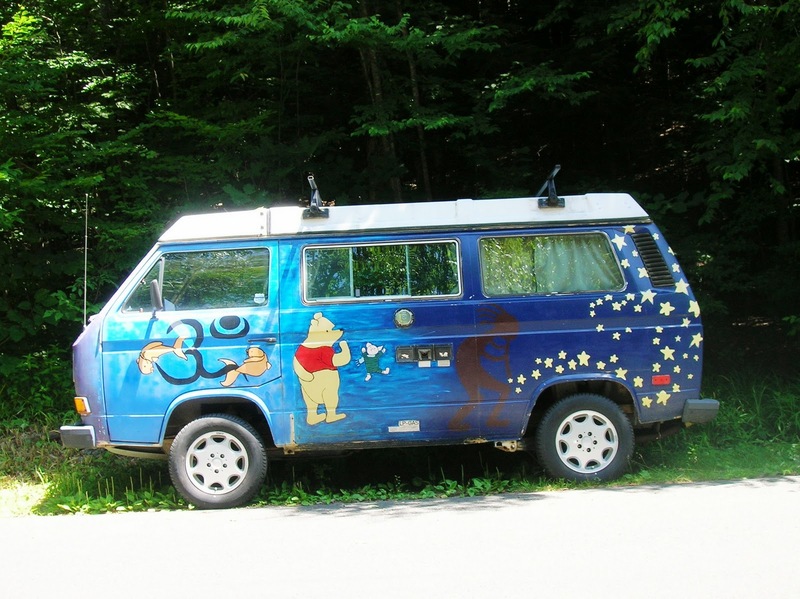 Ah yes, the VW mini bus. 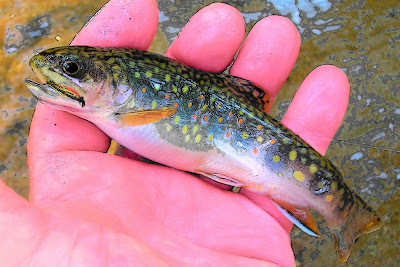 Something I saw while pursuing brookies. Wild beauty that's almost incomparable. 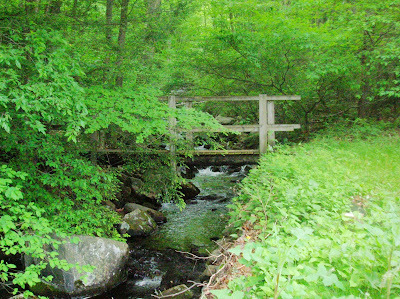 A late spring morning on a free flowing wild trout stream. The sun is moving overhead, I must fish the shadows. 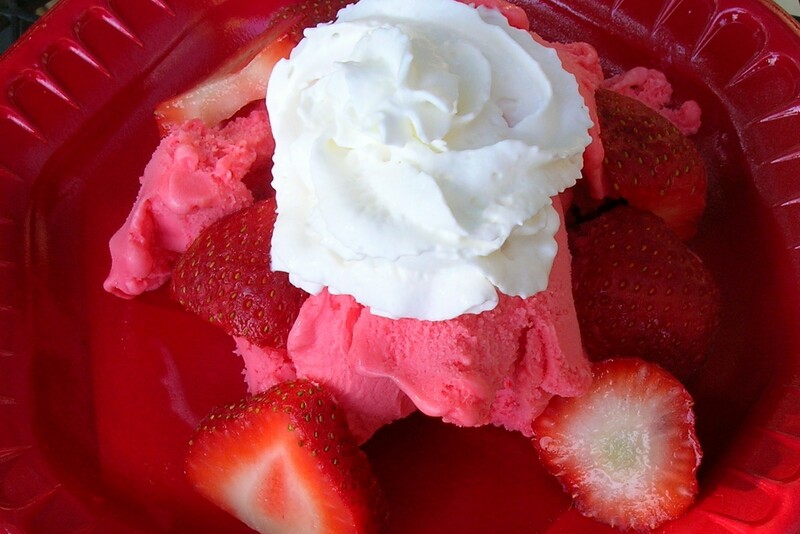 Strawberry sherbet, fresh sliced strawberries, and whipped cream.